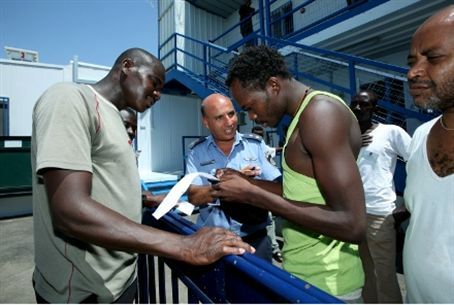 The number of crimes committed by Sudanese and Eritrean infiltrators living in greater Tel Aviv skyrocketed last year, police data shows. Statistics from the Tel Aviv District Police show a 53.2 percent rise in crimes committed by the migrants in 2012, over the previous year. The data was presented Wednesday afternoon at a meeting with Police Commissioner Yochanan Danino and Public Security Minister Yitzchak Aharonovitch. A report released nearly two years ago by the Knesset Research and Information Center supported the findings, with a study that scanned crime statistics from 2007-2010. The report, published May 2011, reflected a rise in the number of criminal cases opened against African citizens, the majority of whom were illegals who had infiltrated the southern border, and asylum seekers. The overall crime rate within the Tel Aviv district has dropped, according to the figures, officials said. In 2012, there was a 1.6 percent decrease over 2011 in the number of criminal cases opened, as well as a drop in the number of motor vehicle fatalities, vehicle break-ins and cases of drug possession and use. But the number of cases opened against Eritrean and Sudanese migrants nearly doubled, from 684 in 2011 to 1,048 cases in 2012, officials pointed out. The number of robberies also rose from 787 in 2011 to 1,160 incidents in 2012.